Mumbai, Jan 5: It had never happened in the history of cricket. But it all changed on a Tuesday afternoon (January 5) in Mumbai when 15-year-old schoolboy Pranav Dhanawade scored an incredible 1,009 not out (327 balls, 396 minutes, 129 fours, 59 sixes) during an Under-16 inter-school match. Already having torn apart the record books on Monday (January 4) with an unbeaten 652, Pranav continued to torment the opposition bowlers as he crossed 1,000 runs, a world record. Thanks to his marathon effort, his team declared at an unbelievable score of 1,465 runs for 3 wickets. Pranav's strike rate was a stupendous 312.38. 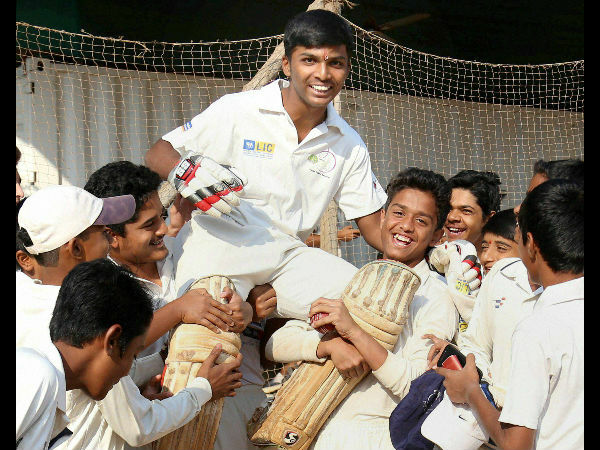 Pranav is hoisted by his team-mates and friends after his world record Never has any individual scored 1,000 runs in one innings, in competitive cricket before today. And it was a historic moment for the son of an auto rickshaw driver. The previous highest individual in any form of cricket was 628 not out by England's AEJ Collins, as a 13-year-old, in 1899. Wicketkeeper-batsman Pranav, playing for KC Gandhi English School, achieved this rare feat against Arya Gurukul School in HT Bhandary Challenge Trophy (Elite Group) match organised by the Mumbai Cricket Association (MCA). Right-handed opening batsman Pranav is a Class 10 student. His record came at at the Union Cricket Academy Ground, Wayale Nagar, Kalyan in Thane district. While Pranav and his team stacked up runs, the opposition earlier on Day 1 were skittled out for a paltry 31 in 17 overs. 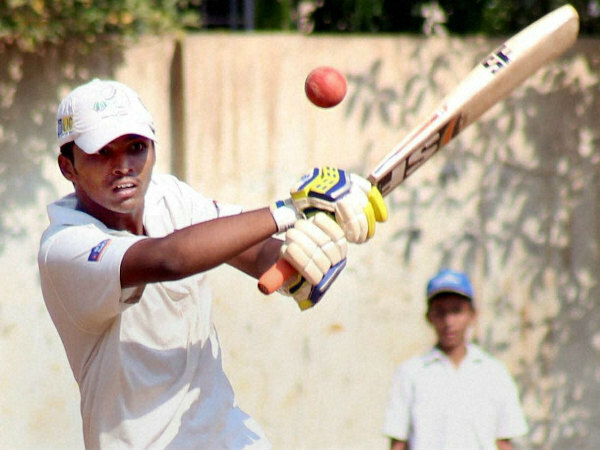 "Dhanawade is with me from the age of six. His feat would give a strong boost to cricket in this area. We have lot of talent in and around Kalyan but lack of proper facilities has hampered it. "Today (former India captain and MCA Vice President) Dilip Vengsarkar came and promised an academy here if he is provided with the ground and our local MLA promised to provide him wherever he wanted it," Pranav's coach Mobin Sheikh told "PTI" news agency. Pranav's opening partner Aakash Singh scored 173 and number three batsman Siddhesh Patil hit 137. The opposition team used 8 bowlers. Ayush Dubey, who took 2 wickets of the 3 to fall, conceded the most runs - 352, in 23 overs. The wickets fell at 546, 1,077 and 1,331. In the second innings, Arya Gurukul were bowled out for 72 in 14.5 overs as KC Gandhi School won by a mammoth innings and 1,362 runs.